These lovely pictures (I’m referring to the location and my photographer’s skills) were taken in the Teign Valley in Devon, only a half hour’s drive from where we live. It was the most amazing landscape I’ve seen since we went to the Grand Canyon two years ago (it definitely compared in a smaller scale, British kind of way). It’s very naughty when these beautiful places are right on your doorstep and you’ve never been there before. Must. Do. Better. 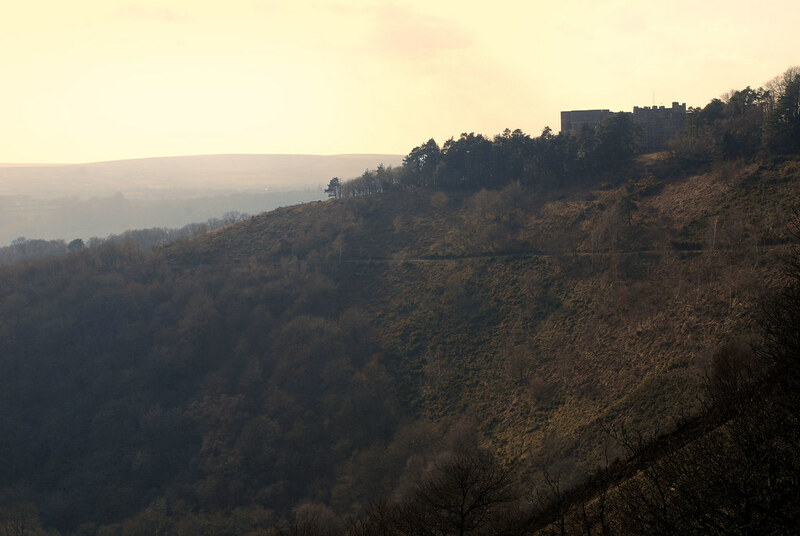 We spent the day exploring the last castle to be built in the UK (Castle Drogo in Drewsteignton, built about a century ago, seen on top of the hill in the next-to-last picture), and the gorgeous hills and walks in the area. 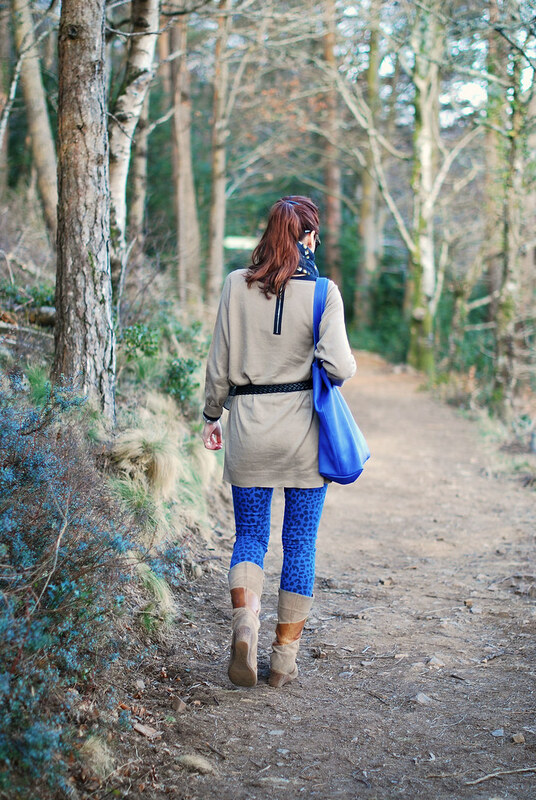 It was comfies on for all the walking – I debuted my new leopard print skinnies and got the layers on for the cold; although it was beautifully sunny, the parka was needed for a little sleep in the sun on the warm rocks. 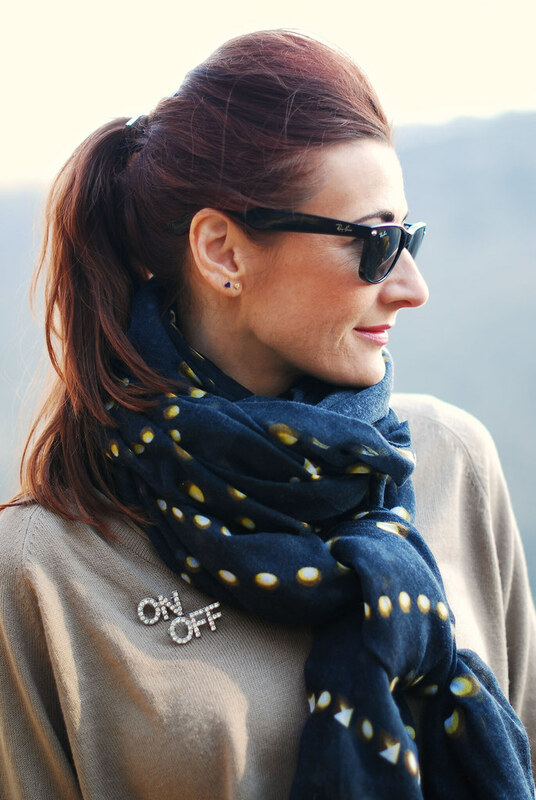 I thought I’d mention the ON/OFF brooches… there’s no hidden meaning, I just liked them – simple as that. Interpret as you wish…! 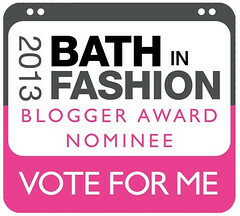 And did you notice my subliminal message to get you all to vote for me in the Bath in Fashion Blogger Awards?! 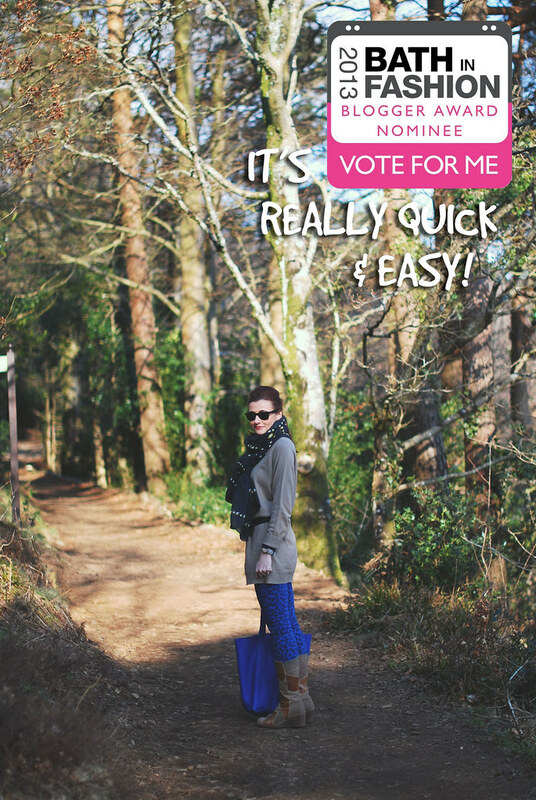 If you’re a fan of my blog please vote for me here – the winner will be crowned a week today at the show so PLEASE GET VOTING! I have to attend in person! I’m so scared!!! Thank you SO much everyone, I love you all!! Love all the different shades of blue in your outfit. Sadly, I missed the voting part since it's past the closing date. In any case, I'm visiting Devon end of May and will definitely put Teign Valley on the list of places to visit! What a fun outfit! I'm in love with cobalt in a bad way! I am in love with that purse!!!!!!!!!!!!!!! Love your outfit, but wow, the landscape there is just breathtaking! Congrats on not only the mention but your photo in the IFB on "8 Fashion Bloggers over 40 …" Gorgeous as always, and I'm proud you represent us! Loving your blue leopard skinnies; you're inspiring me to go on a diet and get some exercise so I can wear something like them! The Grand Canyon is in my back yard and I try to get there once a year. Would like to visit your spectacular Teign Valley! Thank you Berty, so much! Blue and brown can be a very chic combination and you've proven that. I'm really taken with your "old" boots paired with those skinnies! Love the whole outfit and also love the setting! I have a technical question for you. I have voted already, from this PC. We have WIFI at home, but it's connected to the modem and therefore the PC. Would I be able to use my tablet separately to vote for you? I have to connect to the WIFI to use it. Very nice. I immediately noticed your brooch. Fun. Brings some laughter into an outfit. Always good. No reason to get too serious. Looking great as ever. Like your scarf with the outfit as well. Love this chic outfit. Another lovely inspiration, got my eye on your next posts. Thank you Teja! I tried the URL to vote, but no luck with it I'm afraid…??! 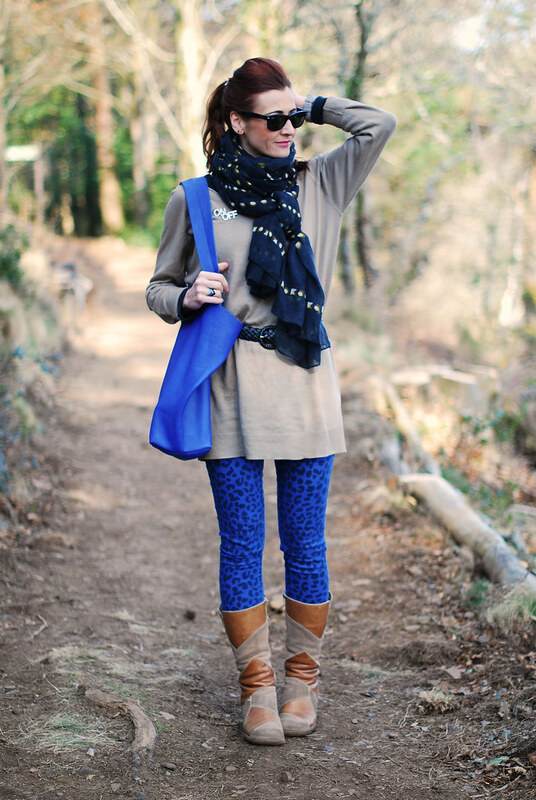 love those cute blue cheetah pants! Great sunnies and skinnies, love that tote! Lovely outfit! And the landscape photo's are beautiful as well. These photos are beautiful. Win or not, you are beautiful and have made one great blog! You are inspired me to start on this blogging venture as a older gal. Thanks for generously sharing your talent! Beautiful pictures…and that scarf is amazing! The whole look is fun! Gorgeous outfit Catherine! I love that you dress up for long walks! Love the skinnies and the scarf! Gorgeous! I Voted! Also I don't do animal print at all, I think it looks weird on me. But those skinnies…boy howdy! They may convert me, they look fantastic! Thank you so much for the vote!!! and for the compliments…!